The prime objective of Europe's Economic and Monetary Union (EMU) is to foster stability and economic growth. But for this to happen, the EMU needs to be able to: first, better prevent crises by fostering sustainable fiscal and economic policies in each of the participating member states; and second, better absorb shocks – individually and collectively – whenever they occur. Most idiosyncratic economic shocks need to be smoothed through the normal operation of national fiscal stabilisers. This requires suitably resilient economies, and the maintenance of appropriate fiscal buffers over the economic cycle. However, when large shocks occur, market pressure can deprive individual countries of their fiscal stabilisers, as was the case during the recent debt crisis, which in turn affects the Eurozone as a whole. This is the reason all mature monetary unions also involve mechanisms for cross-border shock absorption. These stabilisation mechanisms can take the form of temporary fiscal transfers (public risk sharing) or of financial flows linked to the operation of credit and capital markets (private risk sharing). In the EMU, preventing unsustainable policies and absorbing shocks individually and collectively did not work well before or during the crisis, leading to significant economic and social divergence across the Eurozone. This is illustrated in Figure 1 below. 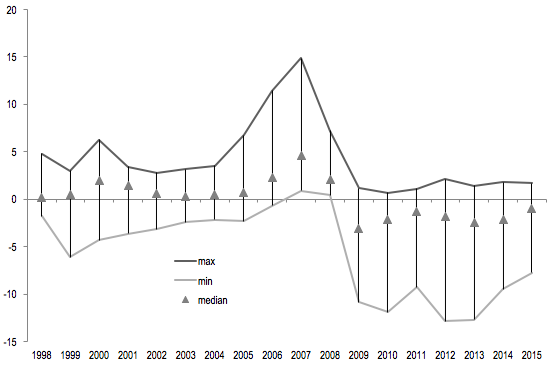 It shows that the difference in the cyclical positions of the Eurozone member states shrank immediately after 1999, the year the single currency was launched. This was a welcome effect of the euro. But the boom years preceding the Global Crisis and the subsequent bust led to a widening of the output gap differences among the member states, suggesting an increased exposure to asymmetric shocks. These legacies from both the boom and the bust years call for efforts to mitigate their negative economic impact. Shock absorption across state borders is a very important element in reducing the negative impact of large asymmetric shocks. The proper functioning of cross-border risk sharing reduces the impact of output loss on consumption and prevents disparities from becoming entrenched. This is the reason why different channels of cross-border risk sharing feature prominently in the so-called Five Presidents' Report, the roadmap towards the completion of the EMU, issued in June 2015 (Juncker 2015). The report pays particular attention to enhancing the shock absorption capacity of the Eurozone, both through better integrated financial and capital markets (private risk sharing) and through a mechanism of fiscal stabilisation among Eurozone member states (public risk sharing). Below, we evaluate how cross-border risk sharing has functioned in the Eurozone and compare it with the US, a fully-fledged monetary, fiscal and financial union. We conclude that cross-border mechanisms for shock absorption in the Eurozone are comparatively weaker. This means that an equivalent loss of output in the US and the Eurozone leads to a much deeper decline in consumption for the latter. Furthermore, the evidence shows that better consumption smoothing in the US is mainly due to well-functioning capital and labour market cross-border channels. Therefore, enhancing private risk sharing among the Eurozone member states, especially through deeper capital markets (e.g. by developing equity and securitisation markets), remains a policy priority. Cross-border risk sharing is linked to integration between countries – first and foremost, economic and financial integration, but also at least to some extent, political and institutional. The channels of cross-border risk sharing can be divided into two broad categories: private and public. The private channels of cross-border risk sharing work through access to foreign financial markets, including through foreign capital markets and cross-border loans and deposits, as well as through labour compensation generated across borders. The cross-border provision of financial services by financial institutions and markets is one of the main ways that private risk sharing operates. Residents of a country that experiences a negative output shock can smooth their consumption through income streams generated by financial assets held in another jurisdiction, which is unaffected by the shock. This is the capital market channel of risk sharing. It operates ex ante because when the shock hits foreign capital, market income is already available to those who have invested in a market shielded from the shock. Alternatively, residents of a country hit by a negative output shock can secure consumption levels by borrowing. This can also be done indirectly, for example when public borrowing is used to compensate for the loss of tax revenues after asymmetric shocks in order to sustain government expenditure levels and, in turn, smooth household consumption. This is called the credit market or savings channel of risk sharing. It operates ex post, since those affected apply for and receive funds from a location that is unaffected by the shock before being able to smooth consumption. The operation of both capital and credit market channels is greatly facilitated by integrated financial markets and competition among financial institutions. This requires the adoption of a legal framework for competitive cross-border financial intermediation (notably insolvency laws and accounting standards), the creation of an efficient financial infrastructure, and the institutional safeguards to ensure stable financial systems—most notably single bank supervision, single bank resolution and a common bank deposit insurance. Only under such conditions can money be truly single in a monetary union. Another private channel of risk sharing that operates through streams of cross-border income is the cross-border labour compensation channel. Residents of a country in which there is a negative shock to output could smooth their consumption with labour income generated in another jurisdiction. This channel requires free movement of labour as well as the prerequisites for a high degree of labour mobility, among which are investment in human capital and the portability of social security rights. Naturally, these private channels are present among Eurozone member states, but, as we will argue, their role for cross-border risk sharing needs to be augmented. The public channels of cross-border risk sharing involve some form of fiscal redistribution between countries. Such redistribution can take the form of, for example, cross-border transfers, social protection, including a common unemployment insurance scheme, or cross-border financing of public investment. The public channels naturally involve a higher degree of political and institutional integration between participating countries, including a system of common decision-making that ensures democratic legitimacy and accountability. The initial EMU design did not envisage a substantial role for cross-border public risk sharing through common fiscal support. Fiscal and political union were assumed, or hoped, to develop over time. To date, the EU budget remains quite small in comparison to the sum of the member states’ national budgets and is mainly designed to support structural convergence rather than to smooth shocks across countries. What is the size of the various risk sharing channels in the Eurozone and the US? A recent study by the European Commission evaluates the relative roles of private and public risk sharing in the Eurozone in comparison to the US (European Commission 2016). The results of the study clearly show that the Eurozone lags significantly behind in insuring against asymmetric shocks, and highlights the untapped potential of private channels of risk sharing. A comparison with the US is relevant because the US can be seen as an economic and monetary union that has developed the necessary institutional framework for insuring against large localised shocks by cross-border means. It is a functioning banking and capital markets union and it also has provisions for smoothing of shocks by fiscal means. Risk sharing between states in the US is well-studied, including in a canonical paper by Asdrubali et al. (1996). The European Commission's study uses the same methodology to gauge the relative importance of the different channels of risk sharing in the Eurozone and the US. Figure 2 summarises the key results. First, the direct impact of output shocks on consumption is almost four times bigger in the Eurozone – close to 80%. In other words, a 1% decline in GDP leads to a decline of about 0.8% in consumption in the Eurozone, against only 0.2% in the US. This shows the huge potential for improving cross-border shock absorption in general, including by completing the architecture of the EMU. Second, cross-border risk sharing through fiscal means is virtually non-existent in the EMU, though neither is it particularly strong in the US. This does not mean that fiscal policy does not have a stabilisation role within each Eurozone member state. The opposite is in fact true, since the average size of government in the Eurozone is larger than in the US. However, the results show that fiscal shock absorption takes place almost exclusively through national fiscal stabilisers. When large idiosyncratic shocks occur, as they did during the recent crisis, this can lead to a sub-optimal level of stabilisation not just for each member state individually but also for the Eurozone as a whole. Finally, the difference with the US is particularly striking in terms of the cross-border capital and labour income channels. Shock absorption through these channels in the Eurozone amounts to around 6% of the shock, while in the US it represents over 40%. So far as the labour income channel is concerned, there is a relatively high share of commuter workers in the US who cross state borders to work, whilst in the Eurozone this phenomenon is common only in Luxembourg. In addition, the US has very well developed capital markets that operate across state borders, whilst firm financing in much of the Eurozone is still predominately through banks, often based on established relationships with local branches. Underpinning the high share of private risk sharing in the US is the Federal Deposit Insurance Corporation, supported by a public backstop. This is crucial for a complete integration of financial markets and to maximise the shock absorption role through the private channel. The public debate on risk sharing in the Eurozone largely revolves around the role of the public sector. Views are highly divided. There are those who, in the spirit of solidarity, strongly argue in favour of a centralised fiscal capacity to allow for the temporary transfer of funds to countries in case of large shocks. Others strongly oppose the idea, underscoring the risk of moral hazard and permanent transfers. While fiscal risk sharing can and, in our view, should play a more prominent role in the Eurozone going forward, this debate misses the main point. 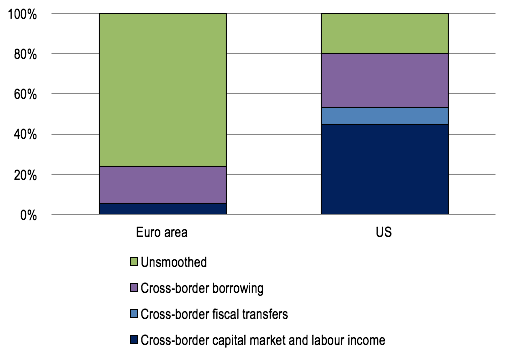 Even if the Eurozone had the same degree of cross-border fiscal risk sharing as the US, the overall degree of shock absorption would still lag significantly behind. The more important deficiencies are in the banking sector and the capital markets. This is where we should prioritise our policy efforts in the near term. In the aftermath of the crisis, the EU has taken ambitious steps towards a banking union. Key elements of the project – notably the Single Supervisory Mechanism, the European Systemic Risk Board, and the foundations of the Single Resolution Mechanism – have been put in place. But other crucial elements are still missing mainly due to political hesitations in some member states. We need faster progress towards a common backstop to the Single Resolution Fund and an agreement on a common deposit insurance scheme. This should go hand in hand with a further reduction of risks in the financial sector, strengthening the availability of ‘bail in-able’ funds and further steps in eliminating the scope of national options and discretions in prudential requirements. Only then will the banking union be completed, creating the necessary conditions for more cross-border provision of financial services and a higher level of shock absorption in the Eurozone. Equally important are the measures to create a Capital Markets Union in Europe. It will reduce firms’ dependence on bank financing and will allow access to cheaper sources of funding. This will improve financial integration by cross-border ownership of financial assets and increase the role of cross-border risk sharing on capital markets. A financial union – a fully-fledged banking union and unified capital markets – is the most effective way to increase the resilience of the Eurozone as a whole, and each of its member states, to economic shocks while at the same time reducing the need to resort to public risk sharing. European Commission (2007), “Cross-border risk sharing: has it increased in the euro area?”,Quarterly Report on the Euro Area 6(3). European Commission (2016) “ Cross-border risk sharing after asymmetric shocks: evidence from the euro area and the United States ”, Quarterly Report on the Euro Area 15(2). Valiante, D (2016), Europe’s untapped capital market: rethinking integration after the great financial crisis, CEPS Paperback.